To say I admire Lauren Santo Domingo's style would be an understatement. I love just about everything she puts together. I first fell in love with her fashion choices last July when she was photographed in her amazing white Chloe shorts (here)! Lauren has a knack for mixing prints in a way that is so effortless and chic. The first four photos are my favorites. I swoon over her mix of a navy blazer, stripes,and feathers! I'm also envious of her stylish NYC apartment-- tons of books,an armoire full of fabulous shoes, and glittery jewelry. Oh, if only. She does have a very very good sense of style! ah she's so perfect! yeah i really love her style! i remember seeing her wedding pics in vogue, so gorgeous! Wow! I love her taste, I will have to look into more about her. Thank you for sharing! I'm sure glitter guide will be full of great stuff just like this, Can't wait! She is SO fabulous! What a flawless sense of style. Wow the white outfit is to die for and so is her office! I understand your obsession! I love those white scalloped shorts! The books and jewelery are amazing too! She is lovely, amazing outfits too! Not heard of her before, I will have to do some googling! She's quite stylish in the way she dresses and decorates her home! she's got an amazing sense of style. and i am so wanting that shoe closet and jewelry collection! I would NEVER in a million years think to put leopard with POLKA DOTS- genuis. love the spanish inspired throw on her sofa, she has such a beautiful apartment! i would kill for that shoe collection/ closet. She has an amazing grace with her sense of style!! I love how her outfits look classic but with an element of fun!! You are just as smitten as I am! She can do no wrong. Love love love this post! Wow! Look at her legs!!!! OMG she's really pretty, she should apply to hollywood and be an actress ! great figure, great style, and fab life. such a dreamy woman . I am dying over this post right now! That outfit with the black feather skirt, oh my goooooddd!! Knowing who you look up to fashion wise is so interesting. I think I've fallen in love also. Love her style and her way of wearing clothes. Wow - everything from her apartment to her clothes breathes style. SHe's definitely a style icon to respect. I want that feather skirt in my wardrobe! oh my goodness i loove her style!! those high waisted scalloped shorts are TO DIE FOR!!!! and I never thought i'd say this but now i want a feather skirt haha I've never seen it pulled together so nicely! Wow I think I've found a new fashionista to be inspired by both fashion and home design wise! Fabulous closet. I blogged about your post today because I loved her closet so much. WOW! What an amazing inspiration she is!!! I love her last outfit!! GORGEOUS! Happy Friday lady! XO! Between the polka dot and animal print combo lazy about to the organization accessories overload.. 'lovely' just doesn't cut it! This girl is gorgeous! I'm checking her blog out as soon as I leave this comment :) It's impossible to even pick a favorite look; her style picks are incredible! I'm gushing at all of them. 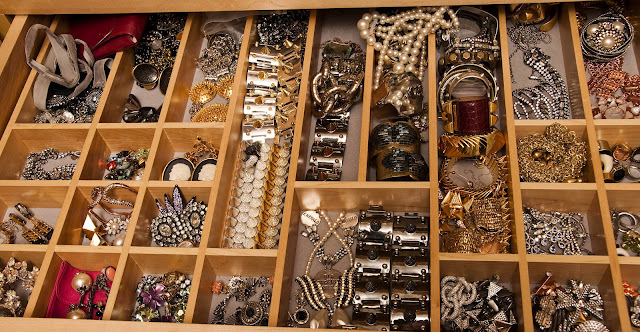 Just spent 20 min examining her jewelry drawer. Now I just need the inside of her medicine cabinet and I'll be as happy as a clam. I love Lauren's sense of style. It'a so funny - I was just browsing through pictures of her this morning for some inspiration, as SF is finally getting some love from the sun this weekend! She's classy, fun, chic and modern all at once. Thanks for sharing these photos! she has the longest legs EVER! Oh my, she is lovely. How does she pull off polka dots and leopard print so effortlessly?